A) Only in case of a DFG-funded position: After you have been accepted the HR department will be in charge of for your formal employment as a Research Assistant. The department will contact you if necessary. B) You are required to enroll formally as doctoral student at Johannes Gutenberg University. Your foreign certificates have to be validated at the International Office - Incoming of Johannes Gutenberg University. You get further information here. a copy of the Certificate of Recognition / validation of the International Office - Incoming. After you get your Certificate of Recognition / Validation you have to apply online for admission to study. The printed version of the online application including all required documents has to be sent to the International Office - Incoming of Johannes Gutenberg University. Further information is provided here. the letter of acceptance from your thesis director. Furthermore you have to hand in a proof of your German language skills in form of the DSH-2-test (German Language Proficiency Examination) or equivalent. 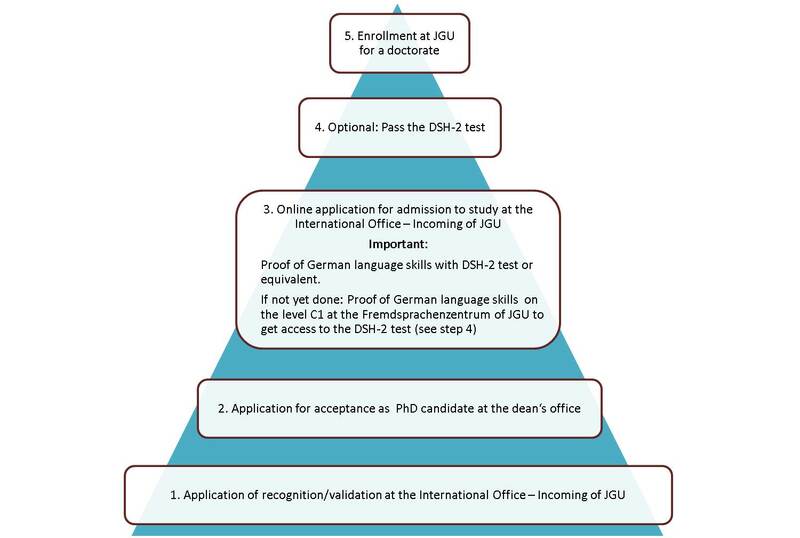 If you do not have a certificate of the DSH-2 test or an equivalent already you need to pass the DSH-2 test at the Fremdsprachenzentrum of Johannes Gutenberg University (see step 4). In order to get admission to this test you have to present yourself for a 10 minute-interview with one member from the Fremdsprachenzentrum of Johannes Gutenberg University to get a certificate approving your sitting for the DSH-2-Test and specifying the level of your German language skills (which have to be at least on the level C1 according to CEFR). You have to hand in this certificate when matriculating. If your thesis director is willing to have you write your doctoral thesis in English, he or she will have to apply for an exemption from the DSH test. In this case you will have to submit this form when applying for admission to study. You have to pass the DSH-2 test. You will be told the exact date for the test with the letter of admission to study from the International Office - Incoming (usually the test will take place at the end of September or early in October). You have to enroll as a doctoral student at the Admissions Office (Studierendensekretariat) of Johannes Gutenberg University. The conditions of enrollment will be stated in the letter of admission.